And welcome to the 900CPX Cookbook. I purchased the Janome 900CPX cover stitch machine late 2012, like Oct or November 2012. I have the Viking S21 serger which converts to a 2 or 3 needles cover stitch machine. I like love the way a cover stitch machine handles hemming knits and applying elastics on lingerie. In fact, the cover stitch function solved my issues with hemming knits. I was always stretching my knit hem during construction. This resulted in a hem line which either fluted or flared giving me the appearance of either an elephant in a tutu or Judi Jetson. I was in love with the cover stitch function, but hated switching between cover stitch and serger mode. It’s not as if I do all my serging, switch and finish my cover stitching. No. Nuh-uh. Garment construction is such that I switch between serger/cover stitch modes frequently. You have to be tweezer-efficient to thread the loopers; and for me at least, a dental mirror is a necessity for inserting needles. In frustration, I started looking at purchasing a CS machine on-line. CS machines are not cheap. Finally, in late 2012, I decided to ask my regular dealer if they could order a CS machine for me. 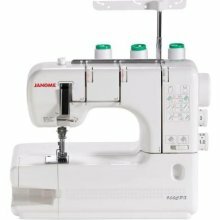 I decided upon the Janome 900 CPX because Janome was the brand of CS they could offer me and the 1000PRO was nearly half as much again (dollar wise) as the 900CPX. I didn’t feel that the one extra needle capability was worth another $200. I do use twin needles for pin tucks and other decorative stitching. I knew that for hemming I wanted the needles wide apart–better chance of catching the hem edge between them. I also knew that I wanted those widely spaced needles for attaching elastic to tricot knits (for the very same reason). For decorative stitching I switch between the various needle spacings but I thought of the CS as a utility machine not as a decorative option. I decided for $200, on the rare occasions I wanted stitching closer together, I could continue to use the sewing machine with twin needles or load up the S21. Would I choose differently today? Would I choose the 1000Pro with 3 needles instead of the 2-needle 900CPX ? I don’t think so. So far I haven’t even missed the 3rd needle. Unless the prices between the two machines were closer together, I’d still choose the 900cpx. I do run into some issues for having chosen the 900CPX. Most of the accessories and instructions apply to 3 needle machines and other brands (Brother, Babylock). Even the Janome manual itself is woefully short of information. There is a total of 43 pages half of which are in Spanish and I believe are only repeating the English instructions. That means there are 21 pages of instructions. Just enough information to get me into trouble. I should be honest here. For the first 6 months or so, I was satisfied to use the CPX only for hemming knits. Eventually my thrifty nature kicked in and I started feeling guilt at having spent a large amount of money for a machine that sits for weeks at a time and is then used for 5 minutes (with part of that spent threading). I began to want to do more. I began to hunt for instructions and accessories. That’s when I realized there is so little information out there that is specifically about the 900CPX. This blog is an extension of my efforts to gather information and apply it to my 900CPX. As I gathered information, I printed it and placed it into a binder. The binder became my workbook which I’m glad to share with you as the 900CPX CookBook. Please enjoy my posts. Add your information and moral support in the comments section. Even share my posts but please give me credit. Please do not simply lift my words and claim them as your own. Guess who is first here! I am not really stalking you – but I am up for any help on my new coverstitcher that I can get. Oh I don’t consider it stalking! I do a wide range of sewing. Some people are more interested in certain subjects, like pants, but don’t really care about machine embroidery or painting fabrics. That you’re here tells me that this part of my sewing is something we share. Glad to have you here. I agree with you there is not a lot of information out there about the coverpro. evn from my dealer. I wanted to buy the clear foot and my dealer said they didnt make anything like that. I knew they did since you had one.I looked on ebay and found what I wanted. I bought the coverpro 1000 after reading your comments about your CS. I have to admit I got a really good deal. So I look forward to any ideas and tips you have. I bought to have dealer support, but in hindsight it was totally unneeded. I haven’t ask them a single question nor asked for a special order of accessories. Because it was “special order” I paid full retail. I wouldn’t special order again. Buying online would have saved me at least $100. (Allbrands lists the 900CPX for $399 as of today 27 July 2013). Another source I can give you is Kens Sewing center. They advertise on Amazon.com which was great for me. I have Prime and didn’t need to give my payment information to yet another company.